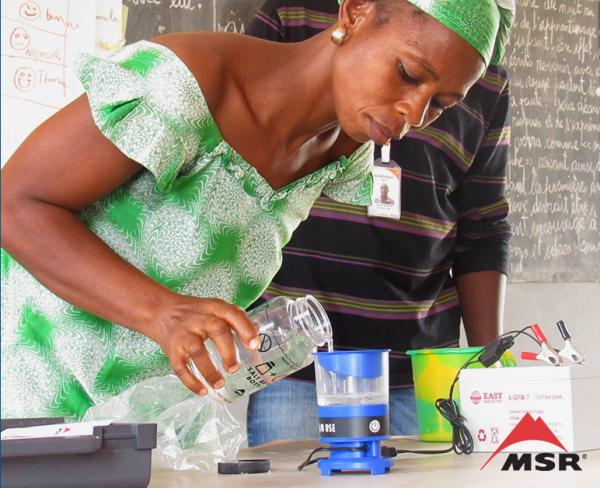 Since it debuted in 2015, MSR’s Community Chlorine Maker has provided many communities in the developing world with a simple water treatment tool that makes chlorine using just salt, water and electricity. While the device is revolutionary for advancing global health, the science and technology behind it is far from new. In fact, the technology dates back more than a decade to a product developed for the U.S. military. Today, many still remember that device: The MIOX Pen was a hand-held purifier that generated chlorine using only water, salt and electricity from two small batteries. By 1998, the military had recognized that purifying water in the field was a key tactical advantage for service members. 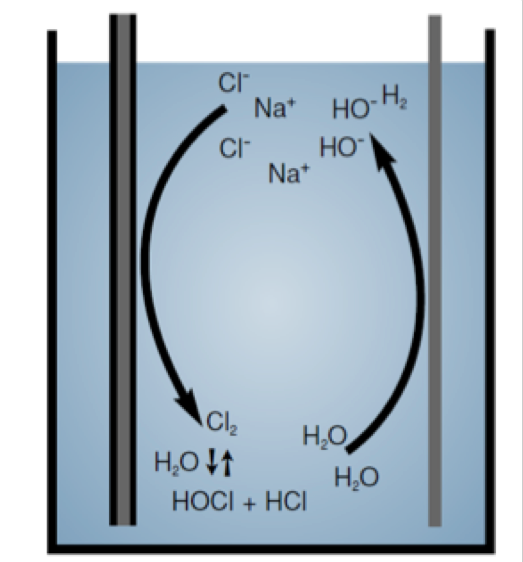 Seeking a way to generate chlorine on the spot, the military turned to two companies that could help: The first, MIOX, had harnessed the process of creating chlorine through the electrolysis of water and salt for municipal systems.  The second company, MSR, was an engineering and manufacturing-focused gear company with the capabilities to turn the MIOX science into an affordable hand-held device for individual use. The MSR-MIOX collaboration resulted in MSR MIOX Pen Purifier, which launched to the military and outdoor recreationalist markets with much acclaim. The Wall Street Journal, USA Today and Newsweek wrote articles on it. Popular Science Magazine honored it with a design innovation award. 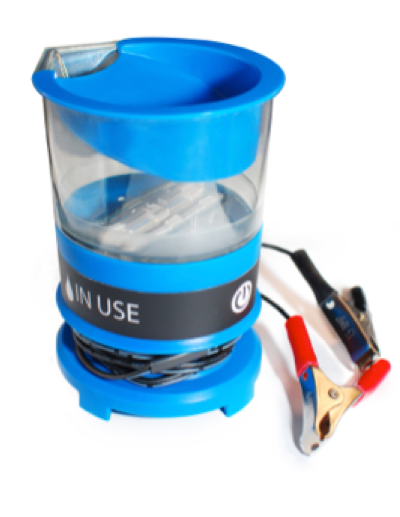 Within its first year, it became the number one selling portable water purifier among outdoor users. 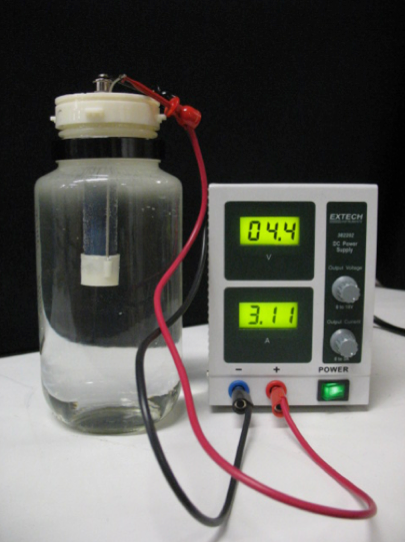 The science behind the device was simple: Electricity from its batteries triggered a chemical reaction between the salt and water ions, generating sodium hypochlorite—or chlorine. When added to water, the chlorine killed any waterborne pathogens present. What made the MIOX Pen revolutionary was its ability to produce a consistent chlorine concentration every time. It did so through a microprocessor which compensated for changes in salinity levels caused by imprecise users (who were required to add the salt themselves), as well as changes in battery voltage as the batteries aged. This original MIOX Pen relied on 6 volts and a single reaction cell that sent the electrical currents through the water. It featured indicator lights that signaled completion or troubleshooting. Today, thousands of MSR MIOX purifiers are still used around the world as a reliable solution for water treatment. Recognizing the benefits of the MIOX pen purifier, a sergeant from the military approached MSR about scaling the technology up into a larger-batch electrochlorinator. Military units in remote regions were struggling to find a solution for surface sanitation (liquid bleach is difficult to transport and breaks down quickly). The MIOX technology’s ability to generate chlorine on the spot using simple resources—just water, salt and electricity—was a huge advantage for service members at distant outposts. 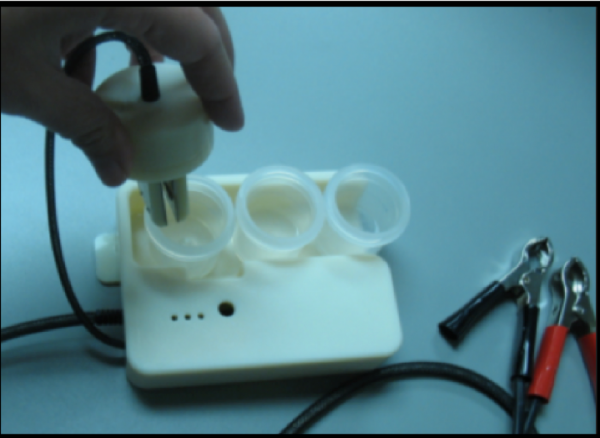 Soon global health NGOs began to take note of MSR’s chlorine-making devices. PATH, a leader in global health innovations, was one. PATH had identified a need for community-sized water treatment in rural villages of the developing world—places where resources are scarce, but water, salt and motorbikes (with batteries) are abundant. Partnering around a common goal to use technology to improve global health, PATH and MSR began designing a chlorine maker that rural water kiosk operators could use to treat the water they sold to community members. 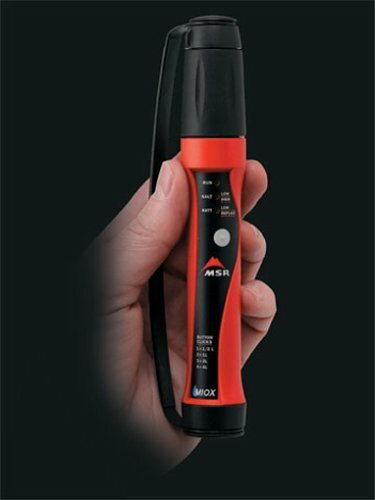 This device, the latest incarnation of the MIOX technology, was called the SE20 (for Smart Electrochlorinator). It produced doses of chlorine that would purify 20 L jerry cans, the most common method for transporting water in these regions. 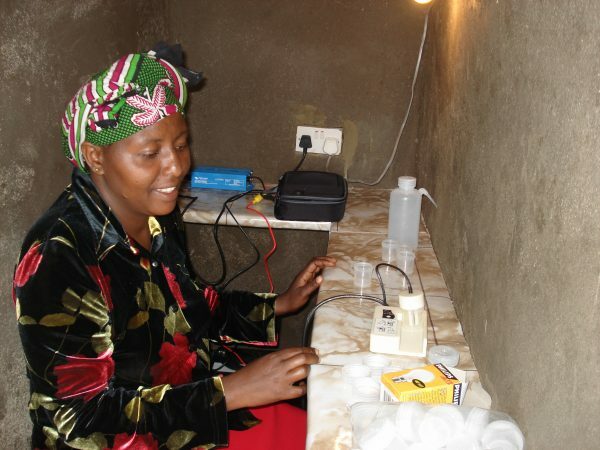 To gain user feedback, PATH took several devices to Korogocho, an urban slum of Niarobi, Kenya. The results were promising. The system served as an effective purification method and its operation was easy to teach across languages and cultures. The trials revealed, however, that the dose size was far too small and inefficient. It simply took too long to purify all the water a community needed in a day. MSR and PATH went back to the drawing board and began conjuring a device that could treat 200 liters in one dose, instead of a mere 20. But this required a redesign. Now the device would feature two electrical cells and would run off 12v (instead of 6), allowing it to be powered more efficiently by car and motorbike batteries. 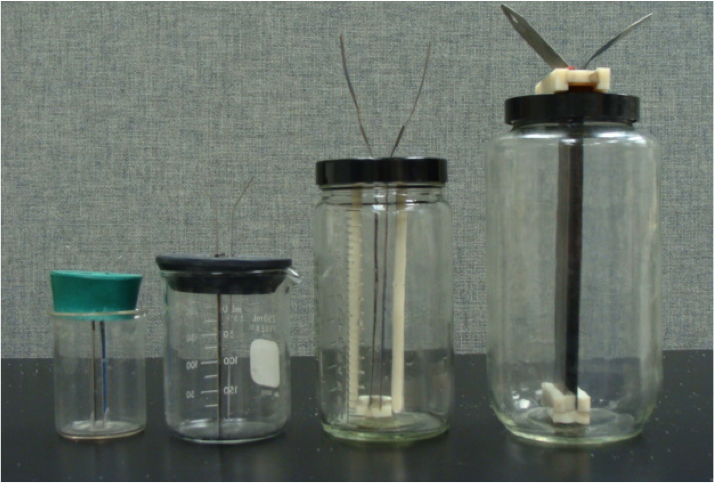 This device also featured an oval shape that was more ergonomical in the hand; its beaker design was easier to pour. A permanent lid was affixed to keep fingers away from the electrode cells, as well as any utensiles that would short it out. Its size, a little larger than a can of soup, kept it from being easily tipped over or lost. One of the most exciting improvements was the reposition of the indicator lights. They were angled to shine through the bubbling, brewing concoction, illuminating the electrolysis process and making it seem like magic. One of the challenges was adapting the device to run off both 12v batteries and a mains power supply. Another was adding decals—what kind of symbol would universally define salt? After further field tests, the color was changed to blue—black represented death in many cultures—and the cells were recessed for protection of the circuit and for ease of manufacturing. 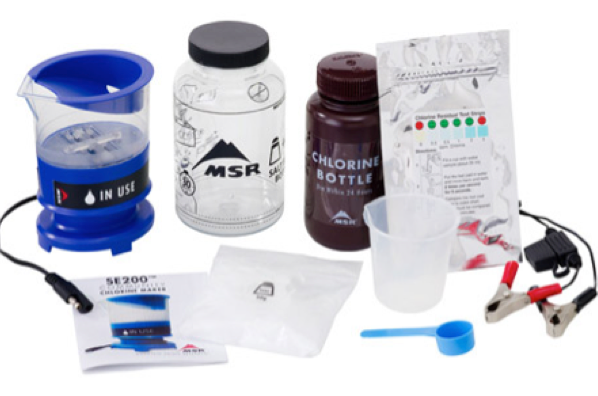 In its final cast, the Community Chlorine Maker came in a complete kit, featuring a brine mixing bottle, dosing spoons and a chlorine storage bottle. It also included testing strips that the MSR team spent numerous hours refining to ensure they were easy to use across language barriers and that their accuracy was consistent across water types. This all-in-one system fully supported the chlorine making and storage process—and increased user acceptance, which was key to the larger goal: improving global health. Today, MSR’s Community Chlorine Maker is being used to create safe water in more than 20 countries worldwide. And MSR’s electrochlorination technology is being applied in devices that can serve large refugee camps and hospitals. Perhaps the technology will be expanded even further into applications yet to be discovered through science, engineering—and many, many prototypes.